National Swiss railway operator, Swiss Federal Railways (SBB), has agreed a $30 million contract with power and automation technology group ABB, to help boost power and increase capacity in the Swiss Alps. The agreement, also in conjunction with Matterhorn Gotthard Railway, will provide three new traction substations on the network in order to meet rising traffic volume in south west and central Switzerland. The work will be completed by 2018. Switzerland has the reputation of possessing one of the most efficient rail networks in the world with more than 97 percent of connections on time. The rail network has been designed to be incorporated into the wider public transport system for commuter and leisure travel. Record numbers of passengers have been recorded on the SBB network over the last two years. In 2013 over a million customers were transported per day and in 2014 SBB transported 1,180,000 or about 3.7 percent more than in the previous year. The number of passenger-kilometres travelled rose by 2.6 percent to 18.2 billion in 2014. The line run by the Matterhorn Gotthard Railway is located in the heart of the Swiss Alps and connects skiing and tourist hubs including Zermatt, at the foot of the Matterhorn, with Andermatt, a mountain town near the Gotthard Pass. On this line, ABB will install a 132/11 kilovolt (kV) substation at an altitude of 1,346 meters above sea level to ensure reliable power supply and enhance voltage stability. 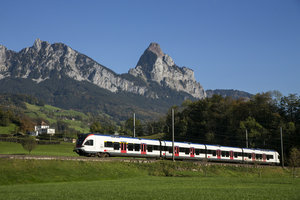 ABB will also construct two 132/66/15/11 kV substations for SBB in the towns of Brig and Luins, replacing temporary mobile substations and providing additional transmission and distribution capacity at important rail hubs that connect the north-south Simplon and Lötschberg lines and lines of the Matterhorn Gotthard Railway, as well as for the Geneva-Lausanne line. ABB will design, commission and install the three substations. Each will include gas-insulated switchgear, air-insulated switchgear, traction transformers and auxiliary power supply equipment. All three substations will also be equipped with automation, protection and telecommunication systems.